The residential with 1st storey commercial site at Alexandra View (Parcel A)is launched for sale under the Confirmed List, 2nd Half 2015 (2H2015) Government Land Sales (GLS) Programme. This attractive land parcel is located next to Redhill MRT station, within an established residential estate. Residents can enjoy quiet respites at the nearby recreational parks at Telok Blangah Hill and Mount Faber. 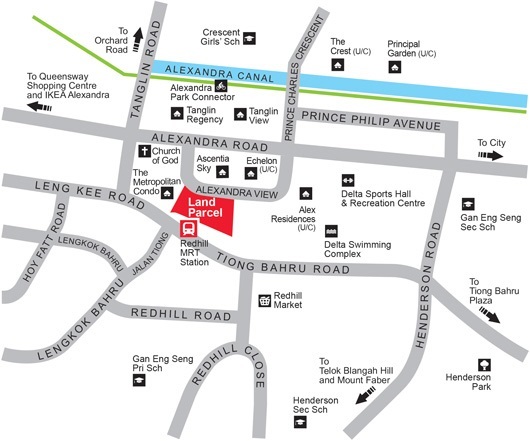 The land parcel is located near commercial amenities such as Tiong Bahru Plaza, Queensway Shopping Centre and IKEA Alexandra. The future development is also ideal for families with school-going children, with Crescent Girls’ School and Gan Eng Seng Primary and Secondary Schools located nearby. + Stratum of Air Space and subject to cadastral survey. 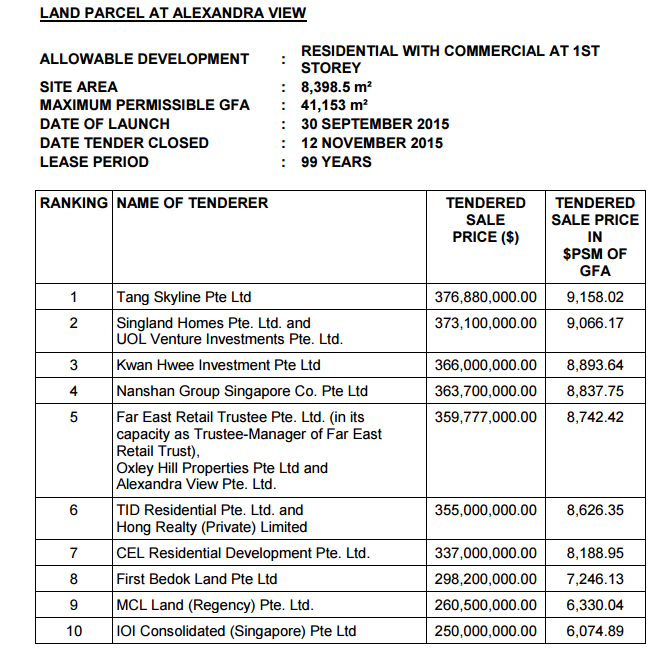 A 99-year leasehold site next to Redhill MRT Station, located along Alexandra View, drew 10 bids at a state tender. The highest bid by Tang Skyline Pte Ltd was for S$376.9 million or about S$9,158 per square metre per plot ratio (psm ppr). A cap of 400 residential units has been placed on a future project on the site. The site is to include a maximum 21 commercial units, including a supermarket of at least 1,000 sq m. Smaller commercial units have been set at a minimum size of 50 sq m each. Taking away the maximum commercial gross floor area (GFA) of about 2,000 sq m, this means a maximum average GFA per residential unit of about 98 sq m – far more than usual 70 sq m. At the same time, the site allows serviced apartments, or a mix of both flats and serviced apartments. Estimated breakeven price for a residential development is about $1,350 psf to $1,400 psf. Why Invest In Artra Condominium? For more information on Artra, simply fill up your details below and our salesperson will get in touch with you shortly!